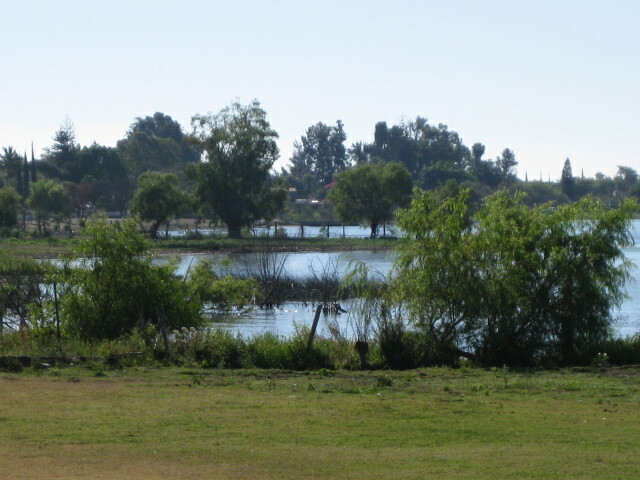 The Real de Chapala is located in Lower La Floresta, just a couple of blocks from my little casita. It is easy to find if you know about it. There is a sign pointing towards it to the left as you come in on the main road (Carretera) from Chapala towards Ajijic. I didn’t notice that sign. I walked around this neighborhood for many months until I noticed the hotel. It is hidden among beautiful homes. The back of the hotel goes out to the lake. You can get to the lake from it but you have to walk across a large grassy field, close to a block long. That much space is good for the birds. They are far enough away from the hotel to trust that they can be safe. There is a beautiful marsh on the left side of the field and half submerged trees are perfect stands for different varieties of birds. I have seen many Pelicans there. It is a great place for a photographer, if you have a good zoom lens on your camera. Luckily, mine is 16x. I have spent many hours sitting there, enjoying the peace with just the company of birds, and the watching the sunsets. 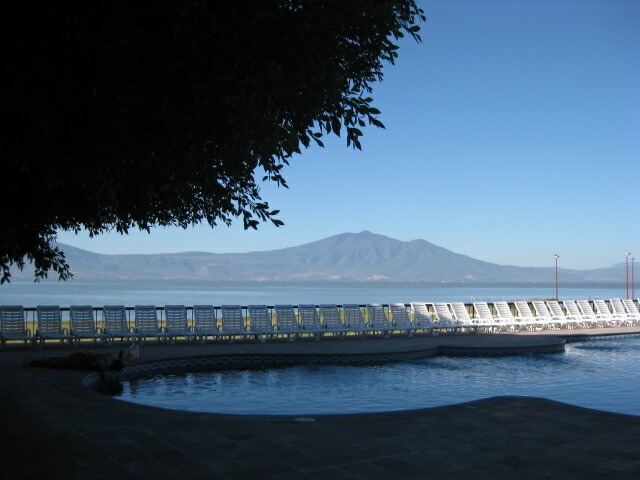 I also like to sit on the benches under huge trees that are at the back of the Real de Chapala Hotel. These trees look very old. The designer of the hotel must have had great respect for the beauty of those trees when he kept them in his plans. The waiters put tables out under these trees on weekends and special occasions. 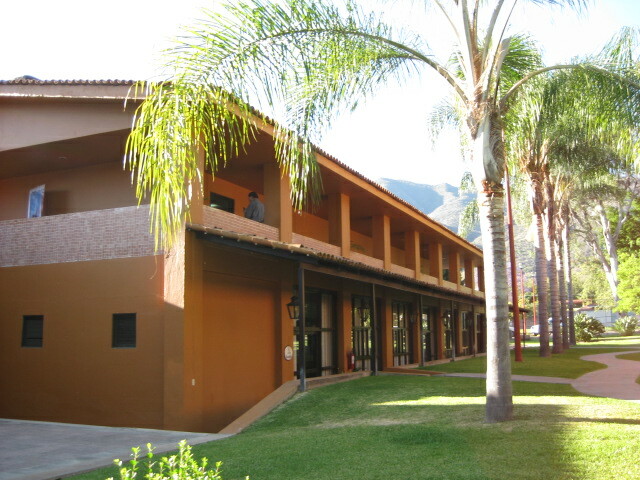 The hotel has 4 convention halls plus a large outside area. In the outside area there is enough room for weddings. 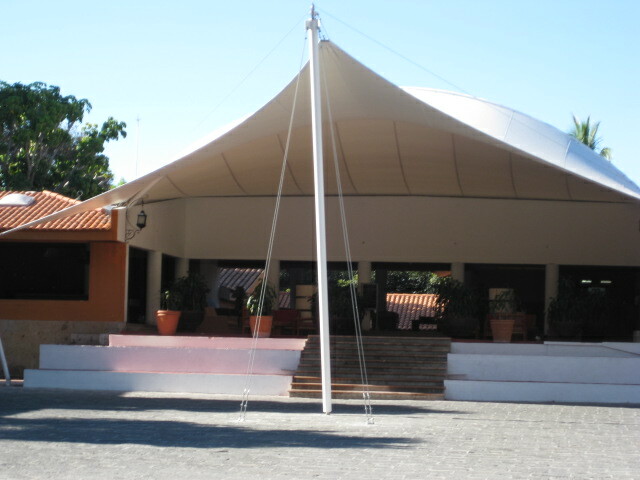 They can also set up a stage for performances. 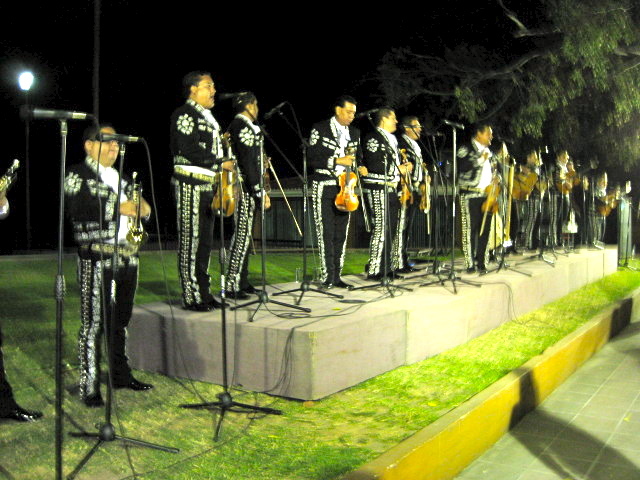 One evening last year, I watched the Mariachi Vargas perform. They are billed as the best Mariachi group in the world. There are 14 members. All of them can both play an instrument and sing. They were great. I believe their billing. I got up and danced after their performance was over. I never do that when I am alone at a performance but I couldn’t resist the music. They continued to play for the dancers for another hour. It was a night that I will remember for a long time. I have seen weddings there and listened to lectures. I have spent many Sunday afternoons at their Lunch Buffets. I also love the Mariachi group that plays there regularly on Sundays. I know most of them by name now, I have been there so often. The waiters know me by sight. I must have taken hundreds of photos there. 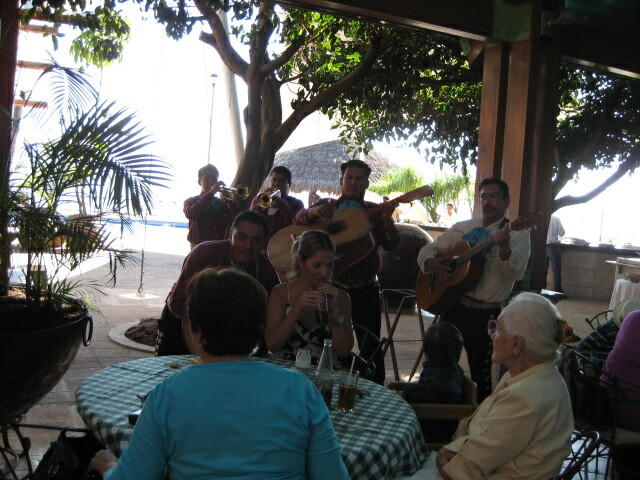 The mariachi group plays from 2:30 to 3:30 on Sundays and before they come out, a man plays the keyboard. He is good too. Sometimes his little girl comes along with him and sits quietly under the shade of the trees while he plays. 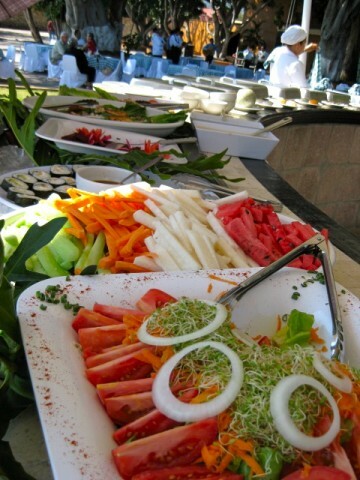 The Sunday Buffets are delicious. They always have different Mexican main dishes plus several salads, rice, potatoes, beans, homemade tortillas and several desserts. They serve from 1:30-5:00 p.m. They also have a Saturday Grill Buffet from 1:30-5:30 p.m. same price. 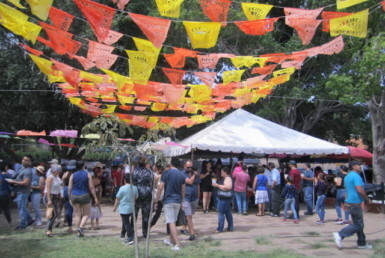 They serve round steak, ribs, steak, chicken, salads, coffee and desserts— but no mariachi music that day. They have a Sunday Breakfast Buffet from 8:00a.m. -12:00p.m. They serve eggs, menudo, fresh orange juice, milk, yogurt, fruit, cereal, breads, and hot cakes. I haven’t eaten at these other buffets so I can’t comment on the food or if there is any other kind of live music then. It is such a beautiful setting, it would be fun even without music. I wish they would allow outsiders to use their pools. I have asked several times, even offered to pay a fee but each time they said no. The pools are only for the guests. There are two pools. One is mostly for the children. They are near each other. That way the parents can watch out for the children. I can walk there and enjoy the view. They don’t keep outsiders from sitting under one of the trees or from walking to the lake from their back area. They also have a nice bar. It is partly outside. I like to sit outside on their little deck and have a margarita, snack on their peanuts and watch the sunset. I love their Japanese Peanuts but I know I shouldn’t eat them. They are real tooth chippers. It is like eating ice. They are that hard. But they are delicious. 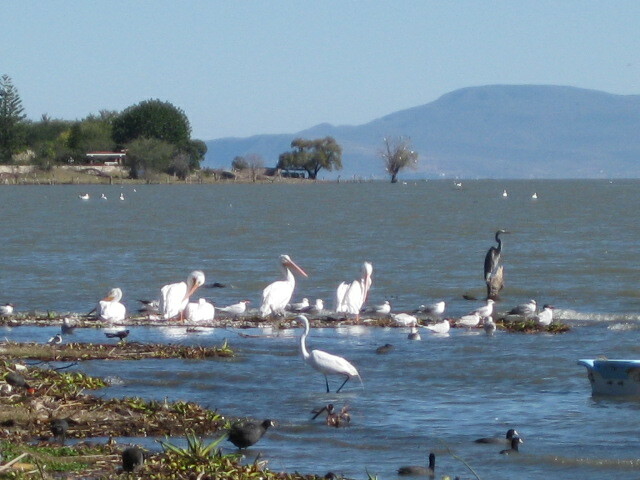 I love to watch the Pelicans on the lake. They have two fountains. One is as you go down the stairs. It is slightly separated from where you walk. Water runs down it constantly. The other one is outside. 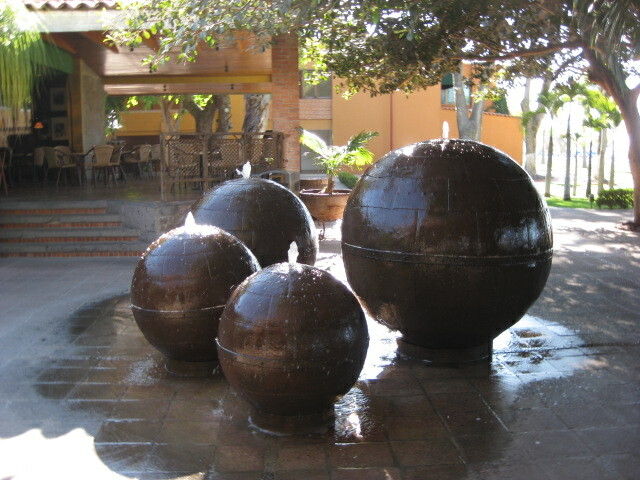 It is four huge metal balls that spurt out water. 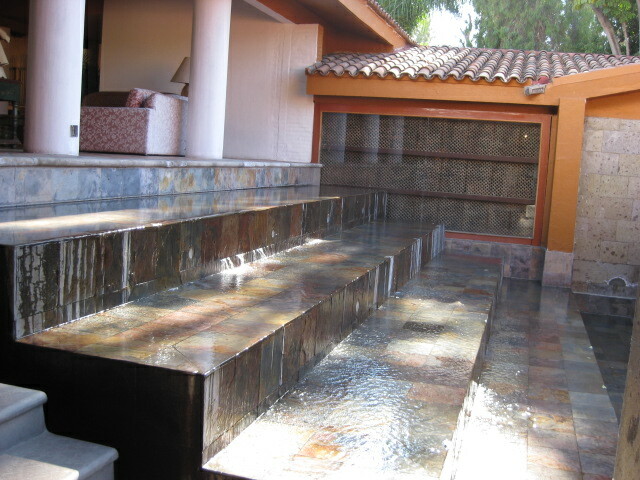 The children love this area because they can touch the wet balls and splash in the water below them. No one seems to mind. I have been inside the rooms. They are nice. Especially if you get one that faces the pools and the lake. There are 85 rooms and 5 suites. There are tennis courts, volleyball courts and a soccer field. There is a recreation area for the children. It is an extremely child friendly hotel. Their inside restaurant is open from 7:30a.m. -10:30p.m. The food is delicious and reasonably priced. Sometimes musicians will come in and play by your table. You can eat by candlelight. There are fresh flowers all around. There is romantic music. There are beautiful views and delicious food. What more would you need for a romantic evening? Oh yes—a partner…. I have been alone for so long that I forgot the most important ingredient. 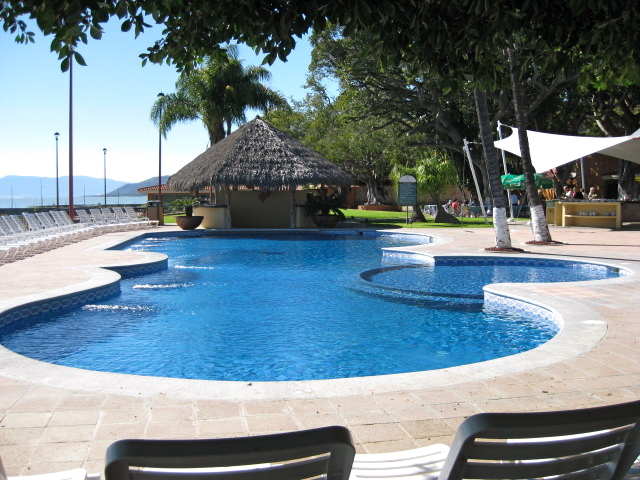 But I still enjoy it at the Real de Chapala Hotel. I am glad I live just a couple of blocks from it. I am happy that I finally found it.